:) lovely...especially the idea of a "mouse running towards summer fields"..
Ahhhh. Spring is waiting for that perfect moment to burst forth. And I am anxious. We're all waiting for summer. Those mice have a huge responsibility. God bless their warm souls. I am ready for the cold of winter to give way to the warmth of summer. The image of mice running through the fields of wheat is clear. Oh, this was wonderful!! Love, love, loved it. andree this is wonderful..very enjoyable.. Very nice, Andrée. I can just picture that little seed holding on for dear life out there in the colds. And visualize the expectant warm mouse's belly readying to carry the seed out for germination. Only a very intelligent and loveing God could conjure up a Mother Nature like the one we have! Thank you for this soooooo nice a rendition for my OSI prompt, 'running.' Thank you. BTW, I hope you aren't so tired of snow that you can't enjoy your latest. I almost miss it, there has been so much hype this year over the snows. This really made me smile, thinking about that little mouse heart, beating that little mouse blood to give energy to scatter the seeds...it was very sweet! Beautiful image! You made me laugh with the mouse, lol. What fun! I can see the seeds scatter. Great words. We're getting the first signs of Spring here in the UK now. Wonderful words and photo. 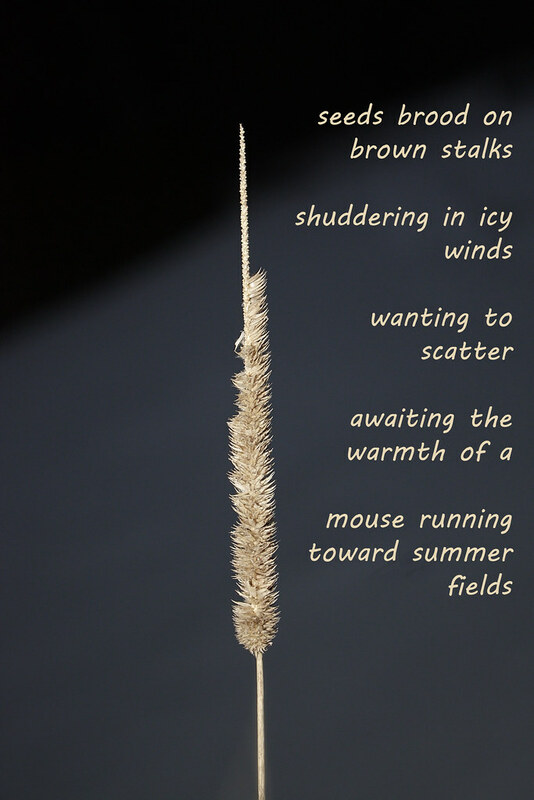 I love the part about brooding seeds and awaiting the warmth of a mouse running towards summers fields. Just lovely. Thanks for that mousy, just too kind to start a new summer blooming all along! This is, I think, a really fantastic little poem rife with all kinds of great images.